Heliconius comprise a colorful and widespread butterfly genus distributed throughout the tropical and subtropical regions of the New World. As shown Helioconius sp. Credits: Richard Bartz, Munich aka Makro Freak - Own work. 10.00 a.m. Coffee. Speed Networking. Other participants include: Michael Barton. This workshop will explore the use of data in biodiversity and biodiversity informatics. With so many stakeholders requiring access to biodiversity data the question of data collection, open data, data ownership, data availability, and data stewardship becomes pertinent. This workshop will discuss aspects of data governance as it pertains to applied projects. Innovative examples of the use of biodiversity data and design will be showcased demonstrating how stakeholders in society (e.g. private companies, citizens, government agencies, NGOs) can use data toward decision-making for sustainability of the species. A g(local) approach to data collection will be debated, barriers to openness, challenges, privacy and security aspects and issues of data vintage and metadata availability. Citizen-science based approaches (e.g. www.questagame.com) will be compared and contrasted to scientific approaches of biodiversity data collection. The use of this data in quantitative and qualitative modelling will also be considered. 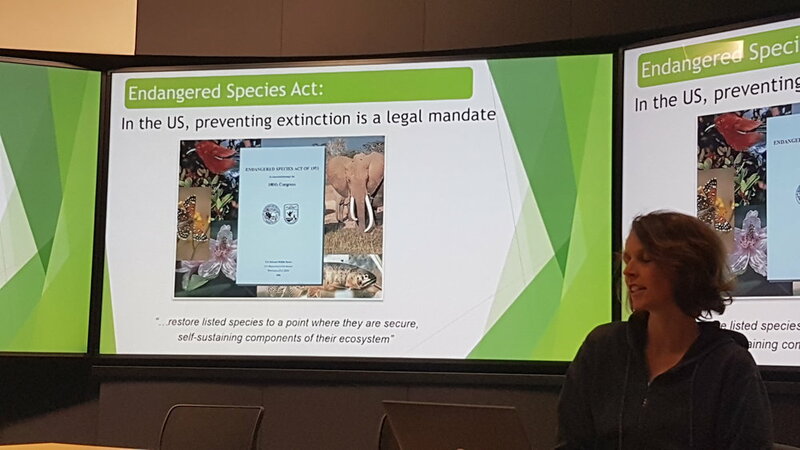 Access to datasets owned by NASA and those by Google and other major government agencies and private corporations will deliberated in light of best practices in biodiversity data management. How to train the next generation of non-computing professionals in biodiversity data science will be another major area of interest for workshop participants, all of whom come from varied disciplinary backgrounds. 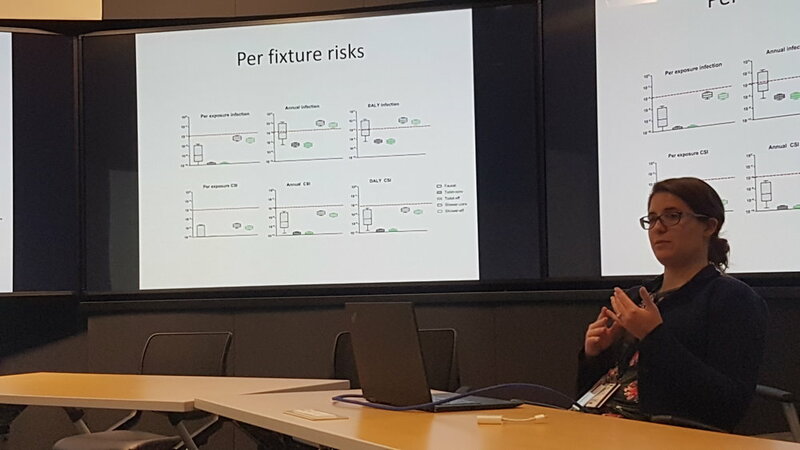 Abstract: This talks looks at the use of data in modeling and is grounded in the lessons learned from a series of major, collaboratively developed research projects at the Decision Theater. An emphasis is placed on the value of collaborative modeling, translating evidence to practice, and the ethical obligations of data stewards and researchers. Biography: Associate Professor Erik Johnston, PhD. Dr. Johnston is an Associate Professor in the School for the Future of Innovation in Society and the Director of Policy Informatics at the Decision Theater at Arizona State University. Johnston’s research focuses on open governance and policy informatics, the study of how computational and communication technology is leveraged to specifically understand and and realize innovations in communities, governance processes, and information interventions. At its simplest, his work tries to reduce the gaps between knowledge creation and use. Johnston earned a Ph.D. in Information and Complex System Certificate from the University of Michigan where he was a two-time NSF IGERT fellow. He holds an M.B.A. and an M.S. in Information Technology as well as a B.S. in Psychology and Computer Science from the University of Denver. His work has been supported by the National Science Foundation, MacArthur Foundation, Robert Wood Johnson Foundation, Helios Foundation, Arizona Board of Regents, American Academy of Diplomacy, US Army, and Virginia G. Piper Trust. Abstract: This presentation will illustrate how digitized, networked biodiversity data from natural history collections can be discovered and visualized to foster an understanding of data availability and suitability of data-driven analysis and decision making. The focus is on Arizona and on data and services produced by Arizona State University's Natural History Collections. 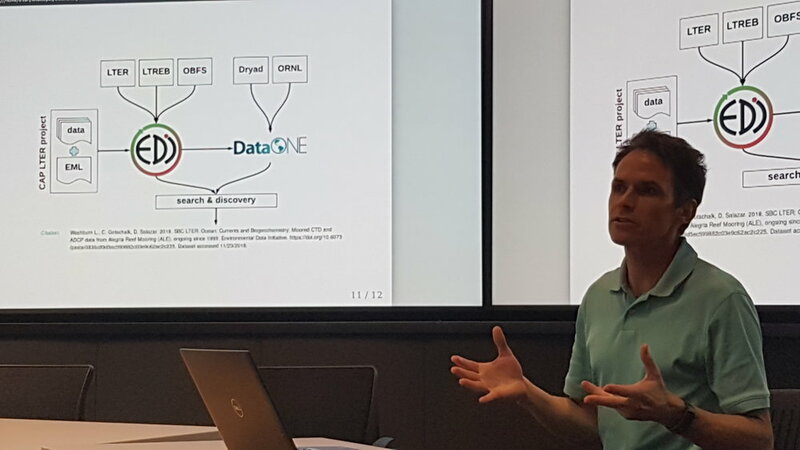 The presentation will demonstrate how ASU's biocollections are currently discoverable through a series of public portals sustained by the Symbiota software platform - a popular, open source, ASU-developed information management system that offers a broad range of biodiversity data research and learning opportunities (https://doi.org/10.3897/BDJ.2.e1114). The examples will hopefully stimulate discussions about integrating collections-based data with the overall workshop theme and its different components. Bio: Nico Franz studies the systematics and evolutionary history of weevils - a lineage of plant feeding beetles estimated to include some 220,000 species worldwide. At ASU, he is the curator of the Hasbrouck Insect Collection, lead coordinator of the Natural History Collections, director of the Biodiversity Knowledge Integration Center (BioKIC), and principal investigator of the National Ecological Observatory Network (NEON) Biorepository. He tweets @taxonbytes. Abstract: Environmental impact assessments (EIAs) document the potential environmental and public health effects of large-scale development projects. Historically, EIAs are produced by industry consultants and evaluated by regulatory agencies, in a process that’s largely reliant on desktop analysis and field-based observations, but often devoid of perspectives from affected communities. But this is changing: concerned citizen groups are increasingly executing data transparency projects, participatory mapping efforts, and funding of independent impact analysis to increase capacity for public scrutiny of EIAs. Such projects are expanding public discourse by drawing out concerns for equity, democracy, community values, and environmental sustainability. Kirk Jalbert explores these relationships through the story of communities grappling with natural gas liquids pipelines at different stages of development in Pennsylvania. Opposition to pipelines has moved to the forefront of anti-extraction movements due to their implications for locking regions into long-term energy development dependencies. Comprehensive data on proposed pipeline routes and their likely impacts are rarely provided to the public. However, in a number of groundbreaking cases, advocacy groups have partnered with capacity building organizations and technical consultants to discover and analyze sources of data to produce alternative EIAs. These efforts have enabled new narratives countering claims of pipeline safety and necessity, thus reshaping dynamics of power between concerned citizen groups, regulatory agencies, and industry. Biography: Kirk Jalbert is an assistant professor in the School for the Future of Innovation in Society with a joint appointment in the School of Computing, Informatics, and Decision Systems Engineering at ASU. His research addresses how public engagements with environmental science and governance are shaped by the use of information technologies in energy justice movements. He focuses on understanding the unique informatics practices and knowledge infrastructures that emerge in these spaces. Prior to joining ASU, Jalbert worked in the nonprofit sector, facilitating data gathering and transparency projects in partnership with concerned citizen groups making sense of their relationships with the energy industry, particularly in the context of debates about the impacts of shale gas extraction and proposed pipeline projects. His recent edited volume, ExtrACTION: Impacts, Engagements and Alternative Futures, examines resistance to resource extraction from a critical ethnographic perspective, exploring why and how resistance movements seek to change extraction policies. Abstract: Lay stakeholder participation in policy making and design processes is typically justified according to a range of instrumentalist outcomes: 1) enhancing the legitimacy of resultant outcomes (regardless of whether those outcomes were in any way inflected by lay participation); 2) providing detailed knowledge of local conditions that external experts might otherwise miss; and 3) even contributing a unique type of expertise grounded in “lay knowledge systems” that is distinct from that of traditionally-trained experts. A distinct rationale for stakeholder inclusion arises from democratic theory and the rights of impacted stakeholders to participate in the making of decisions that impact them. This presentation will provide an overview of a classic policy-making framework—Lindblom and Woodhouse’s 1992 Policy-Making Process—that interweaves instrumentalist logics with rights-based justifications for democratic decision making. It then illustrates the interplay of these alternative justifications within design studies traditions and argues that instrumentalist approaches have come to eclipse rights-based discourses around stakeholder participation in design approaches more broadly. Biography: Dean Nieusma is Division Director and Associate Professor of Engineering, Design, & Society at the Colorado School of Mines. He received his Ph.D. in science and technology studies from Rensselaer Polytechnic Institute and bachelor’s degrees in mechanical engineering and general studies from the University of Michigan. His research focuses on integrating social and technical dimensions of engineering in education and practice, with a focus on design and project-based learning. He is also broadly interested in the social and ethical implications of technologies and the application of engineering and design expertise to enduring social and environmental problems. He has received several awards and fellowships for research, teaching, and service, including a Fulbright fellowship (Sri Lanka) and, most recently, ASEE’s Olmsted Award for contributions to the liberal education of engineers. Abstract: Scientific research is growing at exponential rates, generating potentially useful datasets at a faster pace than humans can practically find, understand, and use it to make decisions about natural ecosystems. While there has been significant progress in systematically and transparent harnessing this data and synthesizing key insights around biodiversity patterns, threats, and mechanisms driving changes in diversity, this is still a particularly time-consuming task. Artificial intelligence approaches such as machine learning and natural language processing present exciting opportunities to automate, or semi-automate the processing of this information to maximize the full potential of the entire universe of research data in near real-time. In order for these approaches to perform, we require greater clarity around common data structures for biodiversity information (incl. taxonomies, geographies, biomes, and conservation approaches). This presentation will discuss new applications of AI approaches to “smart-sort” relevant information from the “evidence universe” and highlight areas where improvement in needed. Biography: By training, Samantha Cheng is a population geneticist and conservation scientist, with experience both in the field working in tropical coral reefs, cephalopod fisheries, seafood sustainability - and in the policy sphere, engaging with diverse stakeholders in organizations, governments, and academic institutions to develop evidence-based solutions for conservation and human well-being outcomes. Cheng's research aims to improve understanding of the process of using scientific evidence in conservation planning and decision-making using a multi-disciplinary approach by systematically examining the role of evidence, methodology, interactions, and stakeholders to determine effective pathways from information to action to outcome. A project Cheng is pursuing at the Center for Biodiversity Outcomes along with Drs. Gerber and Anderson, is examining the public value of conservation, specifically from products of specific mechanism to move from evidence to outcomes, knowledge partnerships. Additionally, Cheng is also exploring the role that data science and technology can play in improving the use of evidence in conservation, leading to developing partnerships with data scientists and developers to design and deploy two apps that facilitate and democratize evidence uptake and use machine learning to help find evidence that matters, respectively. Cheng is a former Fulbright Fellow to Indonesia. At the Center for Biodiversity Outcomes, Cheng aims to contribute insight on best practices for pursuing evidence-informed policy and generating tenable, applicable, and sound science for fisheries management. Abstract: Hundreds of thousands of archaeological investigations in the United States conducted over the last several decades have documented a large portion of the recovered archaeological record in the United States. However, if we are to use this enormous corpus to achieve richer understandings of the past, it is essential that both CRM and academic archaeologists change how they manage their digital documents and data over the course of a project and how this information is preserved for future use. We explore the nature and scope of the problem and describe how it can be addressed. In particular, we argue that project workflows must ensure that the documents and data are fully documented and deposited in a publicly accessible, digital repository where they can be discovered, accessed, and reused to enable new insights and build cumulative knowledge. Bio: Frank McManamon is the Founding Director of the Center for Digital Antiquity (Digital Antiquity) and Research Professor in the School for Human Evolution and Social Change (SHESC.) Digital Antiquity is devoted to improving the access to archaeological and cultural heritage data and documents and ensuring their long term preservation and availability for current and future uses. Before joining ASU in November, 2009, he was the chief archeologist of the National Park Service and departmental consulting archeologist for the Department of the Interior (DoI) in Washington, D.C. Professor McManamon has been involved in the development of policy, regulations, and guidance for public archaeology in National Park system and throughout the government. He has special interests and expertise in archaeological resource management, the long-term access to and preservation of archaeological data, laws and regulations related to cultural resource management and historic preservation, and public outreach and education about archaeology and archaeological resources. He represented the DoI in providing technical assistance for the Kennewick Man case and provided archaeological advice for the General Services Administration on the New York City African Burial Ground project. He served as an expert member of official United States delegations to UNESCO negotiations on illegal artifact trafficking and the protection of underwater archeological resources. In October, 2018, he was appointed by the Secretary of the Interior as a member of the Native American Graves Protection and Repatriation Act Review Committee, a federal advisory committee that assists the National Park Service and Department of the Interior in administering the Native American Graves Protection and Repatriation Act (NAGPRA) of 1990. He has conducted archeological investigations in eastern North America, western Europe, and Micronesia. Abstract: The Acoustic Ecology lab at ASU. Capitalizing on the power and beauty of environmental sound, AELab explores sonic environments through new ways of listening to the land, innovative field recording technologies, interactive sound archives and maps, long-term monitoring and analysis of sonic environments, creative placemaking (musical concerts, audio-visual installations, virtual reality experiences, and sonic story telling), community engagement, and redesign of industrial and urban sound sources impacting livability and wellbeing of human and non-human species. In this short talk I will briefly outline 3 current project. Bio: Garth Paine is a composer, scholar and acoustic ecologist. He crosses art-science boundaries with his community embedded work on environmental listening and creative place-making in addition to his environmental musical works and performances. His research drives toward new approaches to acoustic ecology and the exploration of sound as our lived context including the application of VR in health. Bio: Stevan received his Ph.D. in Biology from Virginia Polytechnic Institute and State University in 2004 where his research focused on the ecology of lotic ecosystems. Stevan joined the CAP LTER following postdoctoral work with the EPA in Athens, Georgia. As Site Manager (2006-2015), Stevan helped to orchestrate the CAP LTER's long-term monitoring programs and experiments. Stevan transitioned into the position of CAP LTER Information Manager in 2015, and now coordinates the CAP LTER's data needs as well as assists students and investigators with research data management. Abstract: I started out in telecommunications planning and design and required to be a data hog when data was clearly unavailable in the late 1990s, unless you parted with a significant sum of money for accessibility. If contracts were worth millions (and in fact hundreds of millions of dollars), then buying data for a fraction of that as a “cost of sales” was not a major problem. Today we realise on a larger scale what we already knew in the late 1990s, you are only as good as your data. Whether it is bureau of statistics in a given country, NASA satellite imagery, Google or Bing maps, and anything else we can get our hands on (even from local councils), unlocking that data to businesses and citizenry can have major impacts. This talk will be given in the context of Sustainable Development Goals and web-based applications like GapMinder. What do we want our future to look like in terms of data and can citizenry act like sensors in the data collection effort? What should that platform look like? And what kind of functionality would give us a view of biodiversity indicators? Biography: Katina Michael is a professor in the School for the Future of Innovation in Society and School of Computing, Informatics and Decision Systems Engineering at Arizona State University. She studies the social implications of emerging technologies. The emergence of big data sets pose socioethical implications, and many challenges related to data governance. Biodiversity data sets are particularly powerful and the clash between the privatisation and openness of these data sets is particularly of interest to researchers of all types who require data for their decision making. Abstract: What are the limits to a centralized approach for biodiversity data? I review some important costs to assuming a single, authoritative database or ontology can adequately support data discovery, integration, and scientific advances simultaneously. I then describe important future challenges to proving the value of a decentralized approach to data stewardship. Biography: Beckett Sterner studies how mathematics is transforming biology, including biodiversity data aggregation, evolution of biological individuality, evolutionary tempo and mode, and methodology in systematic biology. He came to ASU in 2016 as an assistant professor in the Biology and Society Program and affiliated faculty in philosophy. He started his career working in a computational biology lab studying protein function during college at Massachusetts Institute of Technology, and then switched to doing history and philosophy of science for his doctorate at the University of Chicago. He was a National Science Foundation postdoctoral fellow at the Field Museum in Chicago (2012-2014) and a postdoctoral fellow with the University of Michigan Society of Fellows (2014-2016). Abstract: From pain to smell, sensory experiences continue to resist datification. This short thought experiment invites participants to think alongside fish swimming in contaminated waters to imagine what data stewardship currently looks like -- and could look like -- in the absence of quantifiable data. Abstract: Legionella spp. is a key contributor to the United States waterborne disease burden. Despite potentially widespread exposure, human disease is relatively uncommon, except under circumstances where pathogen concentrations are high, host immunity is low, or exposures to small-diameter aerosols occurs. Water quality guidance values for Legionella are available for building managers but are generally not based on technical criteria. To address this gap, a quantitative microbial risk assessment (QMRA) was conducted using target risk values in order to calculate corresponding critical concentrations on a per-fixture and aggregate (multiple fixture exposure) basis. Showers were the driving indoor exposure risk compared to sinks and toilets. Based on aggregate fixture exposures, critical concentrations depended on the dose response model (infection vs. clinical severity infection, CSI), risk target used (infection risk vs. disability adjusted life years on a per-exposure or annual basis), and fixture type (conventional vs. water efficient or “green”). Bio: Dr. Kerry Hamilton is an Assistant Professor with a joint appointment in the School for Sustainable Engineering and the Built Environment and the Biodesign Institute Center for Environmental Health Engineering. She received her doctoral degree in Environmental Engineering from Drexel University in 2016 and Master's degree in public health from Johns Hopkins University in 2009. She was a Fulbright Scholar to Australia in 2015 and Public Health Fellow at the US Environmental Protection Agency from 2009-2011. Brief notes: Conservation decision support, particularly relevant for biodiversity data brainstorming. For decision support, good data on conservation costs and benefits (i.e., biodiversity responses) are necessary and more often than not, this type of data is usually difficult to acquire. Bio: Dr. Gwen Iacona is an applied conservation scientist who uses quantitative and empirical approaches to understand how biodiversity outcomes can be improved by better decision making. Her current work aims to improve endangered species recovery by better understanding the risks and costs associated with recovery planning. Gwen specializes in using theoretical tools to study how the costs of conservation interventions influence the choice of actions and the resulting outcomes for conservation agencies. Past projects include predicting invasive plant cover, modelling protected area effectiveness, and prioritizing conservation action. Gwen currently is a post-doctoral research fellow at the Center for Biodiversity Outcomes at Arizona State University where she is working with Professor Leah Gerber. She has a PhD from the University of Tennessee, where she studied with Professor Paul Armsworth, and an MS from the University of Florida. Bio: Dr. Liu is an assistant professor of Biomedical Informatics and the director of the Bioinformatics Core Facility at Arizona State University. She holds an M.D. degree in Medicine and an M.S. degree in Information System. As a trained clinician and a bioinformatics researcher, she fully appreciates the critical roles genomic medicine and bioinformatics play in advancing precision medicine. By integrating genomic, phylogenetic, population genetic, statistical and machine-learning techniques, Dr. Liu and her research team investigate clinical and molecular signatures of human diseases, and develop novel computational methods to discover biomarkers for early diagnosis and accurate prediction of therapeutic responses for individual patients. Before joining ASU, Dr. Liu helped build and directed the bioinformatics core facility at University of Florida. Bio: Michael Barton is a geoarchaeologist and anthropologist whose research centers on the dynamics of socioecological systems, especially in the context of hunter/gatherers and small-scale agricultural societies. His expertise includes Quaternary landscapes, geospatial technologies, computational modeling, complex systems science, evolutionary theory, and lithic technology.